Congressman Adriano Espaillat pointed out viable sites. It was not just any Sunday stroll. U.S. 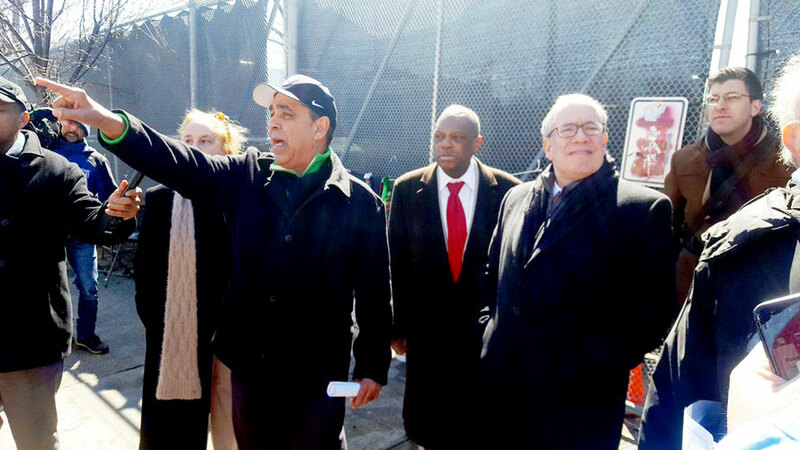 Congressman Adriano Espaillat took elected officials and community members on a walking tour this Sun., Mar. 18th of vacant lots where he said that the city could build 100 percent affordable housing. The Congressman’s role in the rezoning is only advisory. A spokesperson for Espaillat said that in Washington the Congressman focuses on the national budget and immigration reform, particularly for DACA recipients. But constituents continually raise housing concerns. He has called on the city to create 5000 units of affordable housing, with 1000 designated specifically for seniors, in both Inwood and Washington Heights. “We need to expand our ask to include greater possibilities,” he said. Espaillat said Washington Heights must also be considered in Inwood’s rezoning. Each of Northern Manhattan’s four zip codes contain about 3000 apartments with preferential rent riders. If hundreds of new, market rate apartments are added to the area, the overall rents will likely rise. That will create strong incentives for landlords to revoke existing preferential rents and demand market rates instead. “This has the potential to dramatically change our neighborhood in a way we don’t want,” Espaillat said. He led about 40 community residents on a short tour of properties that could be converted into 100 percent affordable housing. Espaillat said at least 14 sites in both Washington Heights and Inwood and 52 vacant lots could be transformed into 100 percent affordable housing. He plans to have at least one more walking tour next week.